Abstract: This dissertation is about a debate that occurred in thirteenth-century philosophy over an apparently bizarre question: Can individuals really have proper names? While scholarly studies have appeared previously on philosophers in the fourteenth century who discussed this question (most notably John Buridan), I show that the question was widespread in the thirteenth century and involved many participants. 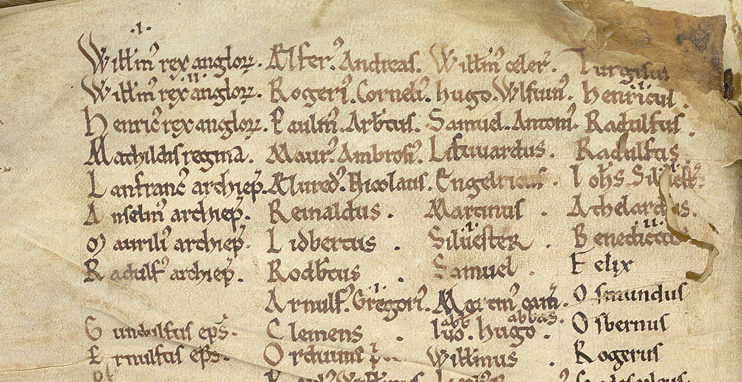 Historically, I offer the first comprehensive account of how the thirteenth-century debate over the possibility of proper names arose. I argue that it was instigated by Michael Scot’s translation of the Metaphysics and perpetuated by tensions within the new Aristotelian metaphysical and cognitive theories of the 1230’s-1260’s. Philosophically, I offer a detailed analysis of the arguments on both sides of the question, presenting and explicating over 15 arguments for and against proper names, in texts by eight different philosophers: Richard Rufus of Cornwall, Adam Buckfield, Geoffrey of Aspall, Robert Kilwardby, Pseudo-Kilwardby, Roger Bacon, Siger of Brabant, and Richard of Clive. The questions I ask are the following. First, how was it theoretically possible to doubt the nameability of individuals? To answer this question, I look at the medieval traditions in the language arts. Specifically, I argue that Boethius’s commentaries on Aristotle’s Perihermeneias provide criteria for what counts as a nomen or “name” in a philosophical sense, but those criteria specifically exclude words that might otherwise be regarded as nomina or “nouns” in a grammatical sense. Granting this distinction, I then ask the second question of the thesis: On what reasonable grounds might a philosopher think that a name of an individual is merely a grammatical “noun” rather than a genuine philosophical “name”? Here the answer seems to be that individuals cannot be named as such because they cannot be understood as such. I investigate two broad motivations in the arguments: (a) human cognitive faculties are not equipped to grasp the individual as such, and (b) individuals are unknowable in themselves because they are composites of matter (which is unknowable) and form (which may be knowable, but which may also be common to many individuals).